viztales | Dimension reduction, State, Orientation, and Velocity. rigidity, integration, chaos = = stampede, flocking and nomad? This entry was posted in Lit Review, Paper, Phil on April 24, 2019 by pgfeldman. This entry was posted in Lit Review, Paper, Phil on April 23, 2019 by pgfeldman. The mission of the Conference on Truth and Trust Online (TTO) is to bring together all parties working on automated approaches to augment manual efforts on improving the truthfulness and trustworthiness of online communications. The inaugural Truth and Trust Online conference will be taking place on October 4th and 5th 2019 at BMA House in London. Adversarial attacks on machine learning models have seen increasing interest in the past years. By making only subtle changes to the input of a convolutional neural network, the output of the network can be swayed to output a completely different result. The first attacks did this by changing pixel values of an input image slightly to fool a classifier to output the wrong class. Other approaches have tried to learn “patches” that can be applied to an object to fool detectors and classifiers. Some of these approaches have also shown that these attacks are feasible in the real-world, i.e. by modifying an object and filming it with a video camera. However, all of these approaches target classes that contain almost no intra-class variety (e.g. stop signs). The known structure of the object is then used to generate an adversarial patch on top of it. In this paper, we present an approach to generate adversarial patches to targets with lots of intra-class variety, namely persons. The goal is to generate a patch that is able successfully hide a person from a person detector. An attack that could for instance be used maliciously to circumvent surveillance systems, intruders can sneak around undetected by holding a small cardboard plate in front of their body aimed towards the surveillance camera. From our results we can see that our system is able significantly lower the accuracy of a person detector. Our approach also functions well in real-life scenarios where the patch is filmed by a camera. To the best of our knowledge we are the first to attempt this kind of attack on targets with a high level of intra-class variety like persons. This entry was posted in Lit Review, Paper, Phil on April 22, 2019 by pgfeldman. Working on the JASS paper. I added enough in the prior work so that the agent research is explained to go along with the picture, and added a section in the lit review for agent-based simulation, because JASS. This entry was posted in Paper, Phil on April 21, 2019 by pgfeldman. The door swung open to a dark room, with no sign of a decoration or decoration for a simple wooden table and a table with no apparent decoration. As my eyes adjusted to the darkness, a pair of eyes I recognized well. He was shorter than the average goblin, even in his long robes, but his build was reminiscent of the ancient orc warrior. He looked at the two on a simple wooden stool, and then looked at me. There was an air of calm in his tone. The voice, it sounded like it was coming from inside the dungeon, but that was all I heard. It was a sound so foreign, the only sound I heard was the crackling of fire. The light was blinding, blinding so much pain that I had to force my eyes open to avoid it. The light was bright enough to completely illuminate the floor of the room, but dim and the brightness did not cause me to see. The eyes of the orc were staring at me, but my mind was racing with questions. What would make this place like it was? Who are we, what will make this land like it is? It’s been a couple millennia, we’re the third tribe in a short time, and were not going to leave until they had seen us. The people of our tribe were not aggressive, and their weapons were not strong, they were not strong enough to be dangerous on their own. What makes the people of this land so dangerous? 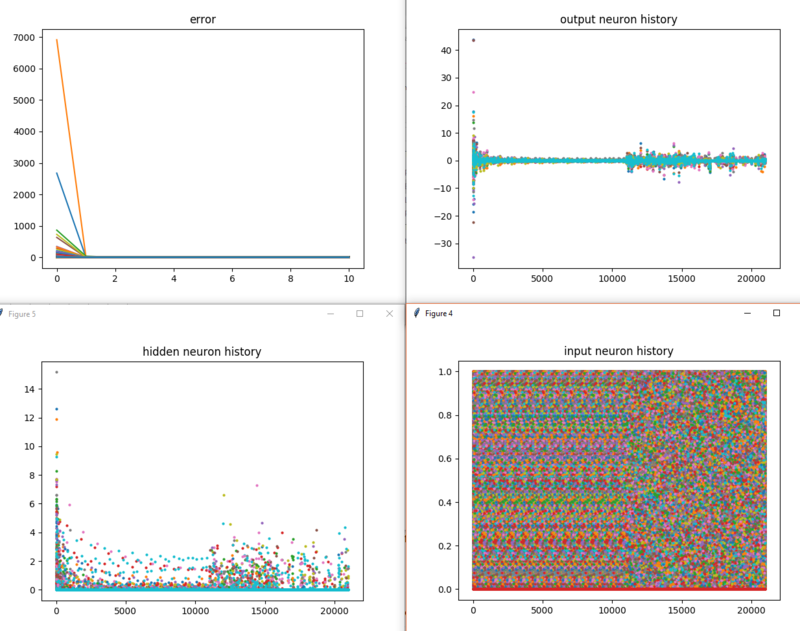 This entry was posted in Machine Learning, Phil on April 20, 2019 by pgfeldman. For a new tool project, I need to have Python analytics served to a thin client running D3. Which meant that it was time to set up a client-server architecture. These things are always a pain to set up. A “Hello world” app that sends JSON from the server to the client where it is rendered at interactive rates, with user actions being fed back to the server is still a surprisingly clunky thing to set up. So I was expecting some grumbling. I was not expecting everything to be broken. Well, nearly everything. If you see those parens, then IntelliJ knows that the file contains a Flask webserver, and will run things accordingly. So how did I get this to work? I bought the Professional Edition of PyCharm (which has Flask), and used the defaults to create the project. Note that it appears that you have to use the Jinja2 template language. The other option, Mako, fails. I have not tried the None option. It’s been that sort of day. By the way, if you already have a subscription to Ultimate, you can extend it to include the whole suite for the low low price of about $40/year. This entry was posted in Phil, Rants on April 19, 2019 by pgfeldman. Updating working copies of the paper based on the discussion with Aaron M last night. Got Flask working (see above for rant on how). Flask-RESTful provides an extension to Flask for building REST APIs. Flask-RESTful was initially developed as an internal project at Twilio, built to power their public and internal APIs. This entry was posted in Keras, Paper, Phil, Python, Tensorflow on April 19, 2019 by pgfeldman. Changed the title of the dissertation again. Now it’s Stampede Theory: Diversity in Networked Systems. We present a scalable approach for semi-supervised learning on graph-structured data that is based on an efficient variant of convolutional neural networks which operate directly on graphs. We motivate the choice of our convolutional architecture via a localized first-order approximation of spectral graph convolutions. Our model scales linearly in the number of graph edges and learns hidden layer representations that encode both local graph structure and features of nodes. In a number of experiments on citation networks and on a knowledge graph dataset we demonstrate that our approach outperforms related methods by a significant margin. Note: In Illustrator, the easiest way to outline an image is to select the image, click on mask, then select the outline stroke, select a color, and you’re done. This entry was posted in Paper, Phil, Python on April 18, 2019 by pgfeldman. Here we describe MorphNet, a sophisticated technique for neural network model refinement, which takes the latter approach. Originally presented in our paper, “MorphNet: Fast & Simple Resource-Constrained Structure Learning of Deep Networks”, MorphNet takes an existing neural network as input and produces a new neural network that is smaller, faster, and yields better performance tailored to a new problem. We’ve applied the technique to Google-scale problems to design production-serving networks that are both smaller and more accurate, and now we have open sourced the TensorFlow implementation of MorphNet to the community so that you can use it to make your models more efficient. Had one of the stupidest, brain-damaged meetings I have ever had. Just destructive for destruction’s sake, as near as I can tell. Updated IntelliJ, which was painful this time, requiring finding Java and Python SDKs that were clearly visible in the settings. I guess it’s that kind of day. This entry was posted in Machine Learning, Paper, Phil, Python on April 17, 2019 by pgfeldman. This entry was posted in Paper, Phil on April 16, 2019 by pgfeldman. one or several paper IDs like “1510.01797” or “math/0506203”. your arXiv author ID looking similar to “grafvbothmer_h_1” to get a list of all your submitted papers. your ORCID ID looking similar to “0000-0003-0136-444X” which you should register with your arXiv-account. Here’s hoping the proposal goes in. It did! Start on IEEE paper? Nope. Did get back to Grokking Deep learning. Trying to get the system working with MNIST. With news pushed to smart phones in real time and social media reactions spreading across the globe in seconds, the public discussion can appear accelerated and temporally fragmented. In longitudinal datasets across various domains, covering multiple decades, we find increasing gradients and shortened periods in the trajectories of how cultural items receive collective attention. Is this the inevitable conclusion of the way information is disseminated and consumed? Our findings support this hypothesis. Using a simple mathematical model of topics competing for finite collective attention, we are able to explain the empirical data remarkably well. Our modeling suggests that the accelerating ups and downs of popular content are driven by increasing production and consumption of content, resulting in a more rapid exhaustion of limited attention resources. In the interplay with competition for novelty, this causes growing turnover rates and individual topics receiving shorter intervals of collective attention. Implements the FM³ layout algorithm by Hachul and Jünger. It is a multilevel, force-directed layout algorithm that can be applied to very large graphs. Implements the H3 layout technique for drawing large directed graphs as node-link diagrams in 3D hyperbolic space. That algorithm can lay out much larger structures than can be handled using traditional techniques for drawing general graphs because it assumes a hierarchical nature of the data. It was first published as: H3: Laying out Large Directed Graphs in 3D Hyperbolic Space . Tamara Munzner. Proceedings of the 1997 IEEE Symposium on Information Visualization, Phoenix, AZ, pp 2-10, 1997. The implementation in Python (MIT License) has been written by BuzzFeed (https://github.com/buzzfeed/pyh3). Professor Banaji studies thinking and feeling as they unfold in social context, with a focus on mental systems that operate in implicit or unconscious mode. She studies social attitudes and beliefs in adults and children, especially those that have roots in group membership. She explores the implications of her work for questions of individual responsibility and social justice in democratic societies. Her current research interests focus on the origins of social cognition and applications of implicit cognition to improve individual decisions and organizational policies. Children and adults differentiate statements of religious belief from statements of fact and opinion, but the basis of that differentiation remains unclear. Across three experiments, adults and 8-10-year-old children heard statements of factual, opinion-based, and religious belief. Adults and children judged that statements of factual belief revealed more about the world, statements of opinion revealed more about individuals, and statements of religious belief provided information about both. Children—unlike adults—judged that statements of religious belief revealed more about the world than the believer. These results led to three conclusions. First, judgments concerning the relative amount of information statements of religious belief provide about individuals change across development, perhaps because adults have more experience with diversity. Second, recognizing that statements of religious belief provide information about both the world and the believer does not require protracted learning. Third, statements of religious belief are interpreted as amalgams of factual and opinion-based statements. This entry was posted in Lit Review, Phil, Python on April 15, 2019 by pgfeldman. Wound up having an impromptu meeting with Aaron M.
This entry was posted in Paper, Phil, Talks on April 11, 2019 by pgfeldman. FOCUS AREA 3- Machine Intelligence – Harnessing the speed and scale of machines to exponentially increase human capacity to command & control in an increasingly complex battlespace. The complexity of MD operations will quickly exceed human capacity and will require machine reasoning to augment the human decision maker across all stages of the C&C Monitor, Assess, Plan, and Execute (MAPE) cycle. CONTENT AND FORMAT: Offerors are required to submit 3 copies of a 3 to 5 page white paper summarizing their proposed approach/solution. The purpose of the white paper is to preclude unwarranted effort on the part of an offeror whose proposed work is not of interest to the Government. Section C: Technical Summary and Proposed Deliverables. All white papers shall be double spaced with a font no smaller than 12 point. In addition, respondents are requested to provide their Commercial and Government Entity (CAGE) Code, their unique entity identifier and electronic funds transfer (EFT) indicator (if applicable), an e-mail address and reference BAA FA8750-18-S-7014 with their submission. This entry was posted in Paper, Phil on April 10, 2019 by pgfeldman.